I request the list members opinion on the management of this case. 65 year old male patient was allegedly injured in a railway accident two months ago. He was treated till recently elswhere and has now been transferred to our centre. Had suffered pelvic ring injury and urinary bladder injury. Was treated with lower abdominal laparotomy, bladder repair and an SPC. No active treatment was done for the bony injuries. In our centre we found that there is an unstable pelvis which could be compressed and distracted. 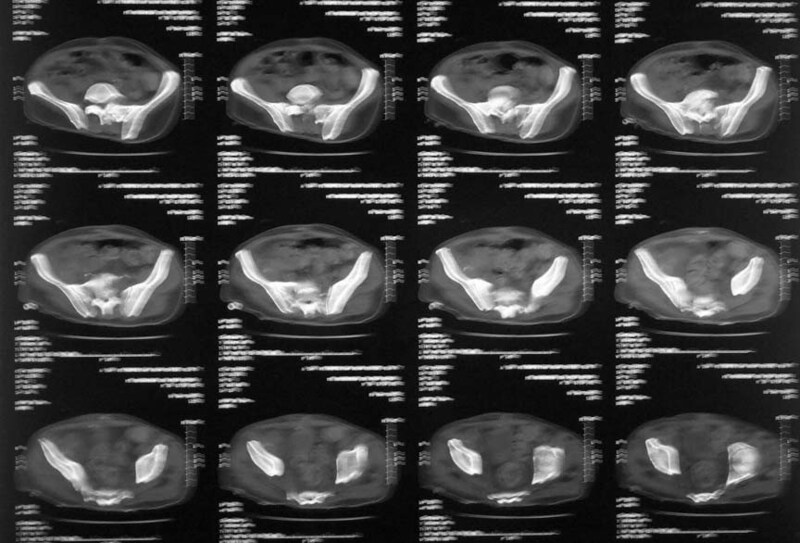 bilateral acetabular injury with central fracture on the right side - femoral head partially caught in the floor of acetabulum, left side femoral head located, sacral fracture with ant body comminution etc, a suprapubic urinary catheter with wound infection, a bed sore over the left gluteal region etc. Our urologist was able to convert the bladder drainage to an urethral catheter. The right femoral head could be pulled out of the floor of the acetabulum and reduction retained on axial skeletal traction. The anterior pelvic ring has been stabilised on external fixator. Small rotation flap was done for the left gluteal pressure sore and is healing. Our plan is to retain the ext fix for about six weeks and then remove it. May be retain the right hip traction for similar period. Hoping that the pelvic ring will be stable in the mean time and then a little later plan for a total hip replacement on the right side. I would welcome your comments, criticism and suggestions on the management of this case. I think your plan is okay. His femoral head damage looks horrible in the film you attached. 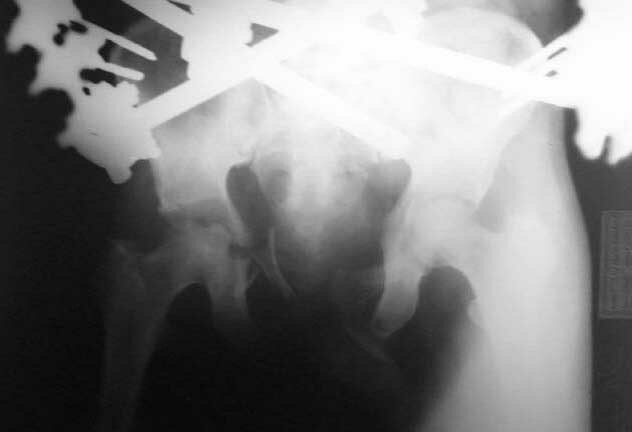 He's likely to develop arthritis in the future - you may be smart to avoid hardware and surgery with a hip like that. Thank you Adam for the kind comments. Can I ask you two hypothetical questions? 1) Is there anything more that we can do to enhance bony union in this situation like any pharmacological agents? 2) At the end of six weeks of fixator when the fixator is removed if the pelvis is still unstable what are the options? Now he is almost three weeks on the fixator and the pin tracks are begining to grumble! 1) Is there anything more that we can do to enhance bony union in this situation like any pharmacological agents? No magic drugs that I'm aware of. Avoid cigarettes and make him eat. Smoking and malnutrition both slow fracture healing. Drugs like the BMP's are only available (in the USA anyway) as somenthing you lay directly on the fracture. So, they require an open procedure. My guess is that his fractures will go ahead and heal. They may heal crooked, but they'll heal. 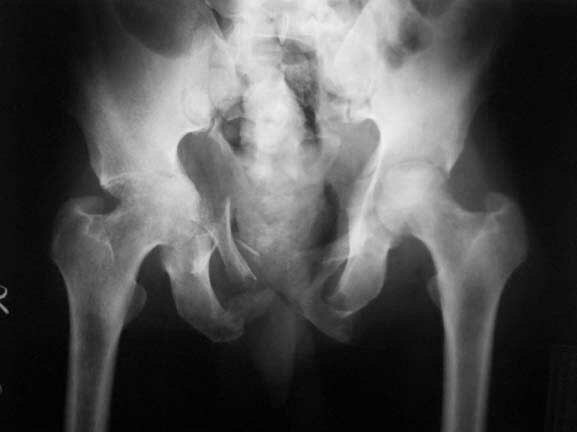 2) At the end of six weeks of fixator when the fixator is removed if the pelvis is still unstable what are the options? Now he is almost three weeks on the fixator and the pin tracks are begining to grumble! Anterior ex-fix frame pins almost always "grumble". Patients don't like them much, and they usually pus out. The other option is to fix his anterior pelvic ring. The other option is to fix his anterior pelvic ring. After two months (will be three and a half by the time fixator is out) won't it be asking for too much to open and try to fix all these fractures! 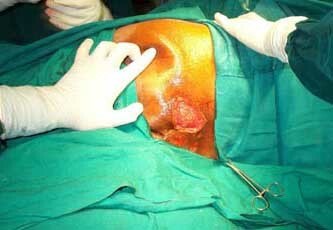 He had a lower abdominal laparotomy, bladder repair, prolonged SPC etc. I know it can only be an academic question but scares me to think about having to do it. DTIG> Our plan is to retain the ext fix for about six weeks and then remove it. May be retain the right hip traction for similar period. Why not use femoral extension to the current fixator? It would allow to stand and walk with crutches. DTIG>Hoping that the pelvic ring will be stable in the mean time and then a little later plan for a total hip replacement on the right side. Why not use femoral extension to the current fixator? It would allow to stand and walk with crutches? Considered this option to get over the traction. Deferred it because patient has to undergo a THR in the future and hence wanted to avoid a pin tract in the femur which could be a focus of infection later. He already had infected SPC wound and bed sore. So had a high chance of infecting pin sites. I wonder whether you saw my subsequent mail in which I said that the ex fix pin tracts are already begining to grumble. His muscles were totally wasted and are being built up slowly. Besides to be frank I am not bold enough to ambulate such a patient on fixator stabilisation alone so early. In my prctice I wait for bony union to start before bearing weight fully. Otherwise I might be testing the metal fatigue too early I feel. What is your opinion on this? The plan looks reasonable. Thanks for the reassurance. I think you are on the right track. I have had to go in late anteriorly on a similar one , and it wasn't too bad. Just wait until the skin is completely healed. I would hope more for the acetabulum to heal, since a nonunion there would be a major undertaking during hip replacement. Your thoughts on avoiding the femoral pin are good, and will also avoid stressing those existing pins too much. I mean a couple olive wires in the distal femur wouldn't add too much to the infection risk of further THR - it is high already. DTIG> whether you saw my subsequent mail in which I said that the ex fix pin tracts are already begining to grumble. Femoral extension provides better hip stabilization than traction, so skin tension/irritation is lower. DTIG> patient on fixator stabilisation alone so early. In my practice I wait for bony union to start before bearing weight fully. Full WB hardly ever can be maintaned in such a patient because of his poor physical condition, but partial WB with crutches could be a good mobilizing factor. DTIG> Otherwise I might be testing the metal fatigue too early I feel. What is your opinion on this? What parts of the fixator do you mean? Wires in the femur can resist any loading, as well as 4-5 connecting rods. Anyway the planned period of ex-fix is about 6-8 weeks, isn't it? Agreed but in case it is a septate uterus probably better avoid it in both the cavities!! What I was meaning is that I would probably avoid a focus in the same bone. Knowing the present condition of the patient I don't think he will be game for even partial weight bearing. He is being built up physically and morally. I don't think at 65 yrs going through what he had was easy. Wires in the femur can resist any loading, as well as 4-5 connecting rods. What parts of the fixator do you mean? Anyway the planned period of ex-fix is about 6-8 weeks, isn't it? What I had in mind were the Schanz screws in the ileum and the connecting rods. Of course the hold of the Schanz to the cancellous bone again could be a weak area. This community based general orthopedic surgeon would treat this patient nonoperatively. I will be thankful if you could discuss in detail as how to treat this patient non-operatively.